A German snowboarder stranded in the Austrian Alps for six hours has been rescued after attracting attention by setting fire to his cash. 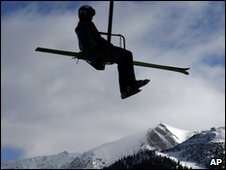 Dominik Podolsky, 22, of Munich, was stuck on a ski lift when it shut down for the day, with the temperature -18C. As darkness fell, he began to burn paper handkerchiefs and the contents of his wallet with a cigarette lighter. He started with restaurant bills and business cards before he was spotted burning the last of 120 euros in cash. Mr Podolsky was taking the lift down the mountain on Saturday when he became trapped about 10m (33ft) above ground. He had forgotten his mobile phone and his shouts for help were not heard. "I thought about jumping down, but then I'd have probably broken both legs and would have frozen to death," Mr Podolsky told reporters. He used techniques learned through military service to fight off hypothermia, but his limbs began to go numb and he kept falling asleep. Mr Podolsky was taken to hospital after a ski-run cleaning crew spotted his last 20 euro note going up in flames. After treatment for hypothermia, he was able to take a train home that night. Mr Podolsky says he is considering suing the company that operates the lift. A spokesman said it was not meant for downward trips and Mr Podolsky had apparently ignored signs warning against boarding it.